Spring Branch Houston is an expansive neighborhood located between two of Houston’s main business districts: Downtown Houston and Energy Corridor. Spring Branch is conveniently located just outside the 610 loop and is minutes from Memorial Park, Galleria, and the Memorial City District. TOP RATED SCHOOLS: Parts of Spring Branch are zoned to public schools ranked amongst the best schools in Texas, according to the Houston’s Best Schools report. GREAT ACCESS: Spring Branch is located near many of Houston’s expressways including: I-10/Katy Freeway, 610 Loop, Highway 290, and Beltway 8. This offers a good commute to major job centers: Downtown, Energy Corridor, Memorial City Mall / Memorial City Medical Center, Galleria, and Greenspoint. PARKS & TRAILS: According to AllTrails, “Spring Branch has some of the best access to Houston’s Hike & Bike Trails.” In addition, the area offers quick access to Memorial Park and the Buffalo Bayou. DIVERSITY: Spring Branch is one of Houston’s largest neighborhoods. A huge demographic shift began in the 1980’s and median home price for areas north of Long Point Road are vastly different than areas south. This is one of the few neighborhoods in Houston where you can regularly find houses both below $150k and over $2M. STRONG REAL ESTATE APPRECIATION: Because Spring Branch didn’t start developing until later, the median sales price of Spring Branch Houston homes for sales have increased by 75+% over the past decade. Spring Branch features homes for sale near the Energy Corridor, Memorial City complex and Galleria. Similar to Memorial homes for sale, properties in Spring Branch have larger lots than average. Homes for sale in the Spring Branch neighborhood are less expensive compared to Memorial real estate on average. However, there are large numbers of newer construction options in Spring Branch at more affordable rates. The area is divided into four mini-neighborhoods with its own collection of civic organizations making a home search challenging for buyers. Due to its size and high number of subdivisions, finding the best Spring Branch Houston Realtor familiar with the area and each of its subdivisions is very important. Enter your email to get this free Spring Branch guide in easy-to-read PDF format. Bonus: Also see how this area compares with nearby top neighborhoods. I am interested in Spring Branch and would like to get more details. Spring Branch is located west of Downtown Houston. It is bordered by the 610 Loop to the east, Interstate 10 to the south, Beltway 8 to the west, and Hempstead Road to the north. The area is very similar to Memorial Houston, with minor bayous such as the Brickhouse Gully and Briar Branch running through the community. Long Point Road, one of the oldest roads in Houston, runs from east to west of the neighborhood. The district offers easy access to Interstate 10, I-610, Sam Houston Parkway, and the Hempstead Highway. The quick and easy commute to Energy Corridor and Downtown Houston, two major job centers in Houston, is one of the many reasons homebuyers relocate to Spring Branch Houston. Spring Branch Houston zip codes include 77080, 77041, 77043, and 77055. Spring Branch Houston is divided into four neighborhoods, each with their own neighborhood association. Spring Branch Central is roughly bordered by Bingle Road to the east, Hempstead Road to the northeast, Clay Road to the north, Campbell and Blalock Roads to the west, and the Westview neighborhood to the south. Outpost Estates Civic Club, Inc.
Spring Branch West is bordered by Interstate 610 to the south; Blalock Road to the east; Neuns, Hammerly, and Clay Roads to the north; and Addicks Reservoir to the west. 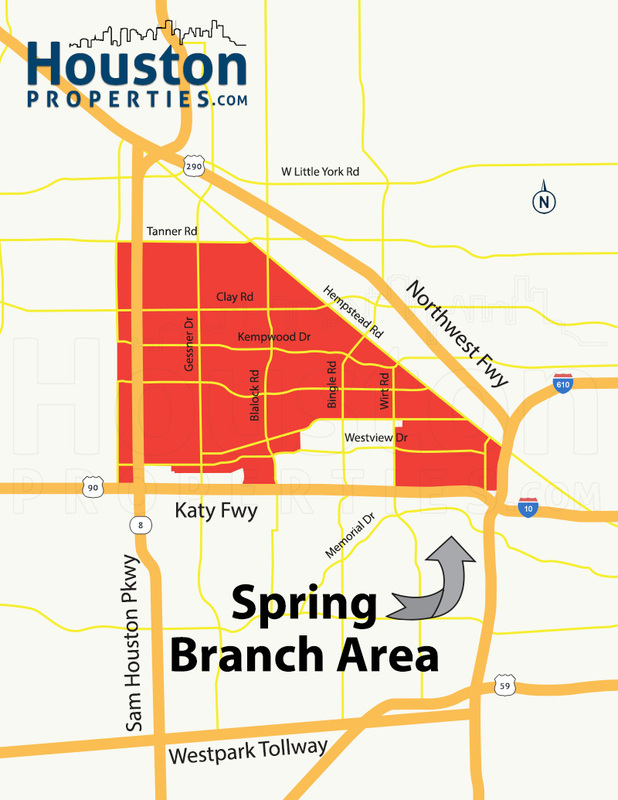 Spring Branch East is roughly bordered by West Loop North Freeway to the east, Hempstead Road to the north, Bingle Road to the west, and Katy Freeway to the south. It is the oldest part of the Spring Branch community. 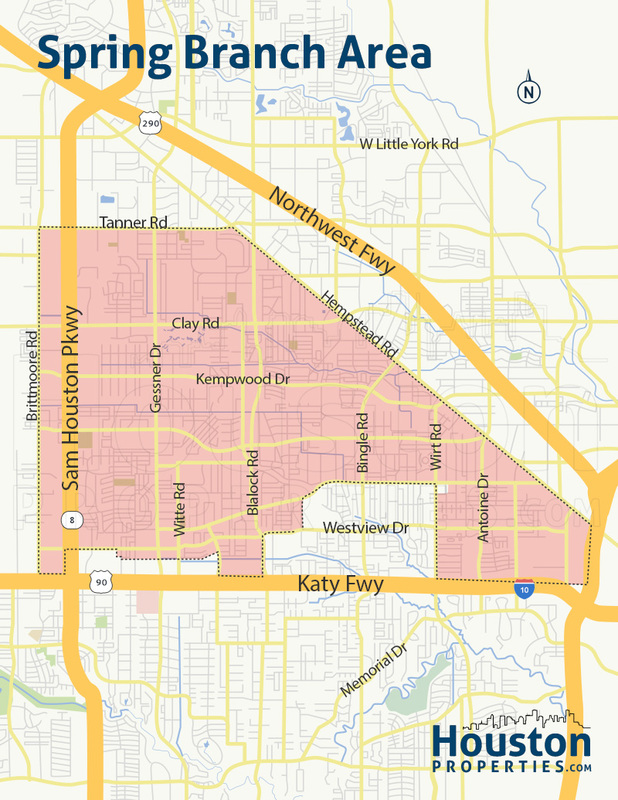 This super neighborhood north of I-10 is bordered by Clay Road to the north, Campbell Road to the east, Neuens Road and Hammerly to the south and the Sam Houston Parkway on the west. Spring Branch community feature some of the best public schools in Houston. After its establishment as a suburban school district in the 1940’s, the Spring Branch Independent School District became popular for its highly-acclaimed schools. The percentage of SBISD students performing at or above college-ready levels have consistently increased and exceeded state rates by 14-24%. Some areas to the northern part of the district are zoned to Cypress-Fairbanks Independent School District. While a small portion of Spring Branch is zoned to the Houston Independent School District, these areas are used for industrial, commercial, and utility facilities. To find an updated listing of all Spring Branch Houston real estate zoned to any specific public school, please email Paige Martin at Paige@HoustonProperties.com with the property type and budget that you’re looking for. Spring Branch homes for sale had a 10-year appreciation rate of 75% – one of the highest in Houston. Spring Branch Houston provides prime real estate not only for housing, but for development as well. With its rapidly growing population and a booming business environment, developers are continuously working on new constructions for those who wish to relocate to Spring Branch. The east side is currently a growing area for new housing especially near Wirt Road. Several gated subdivisions are also replacing deteriorating Spring Branch apartment complexes to make the area more attractive for people who wish to live in a place where they can set roots. Only about 56% of Spring Branch Houston homes are owned and most of the remaining inventory is rented. However, the Spring Branch community is rehabilitating the area to serve more single-family homes. Just like Memorial homes for sale, Spring Branch displays a trend of having pricier homes toward Downtown and gets cheaper as it goes nearer the Energy Corridor. The average number of bedrooms and baths of Spring Branch Houston homes for sale is 3 and 2 respectively. The median year built is 1969. (Data sourced from the Houston Association of Realtors Multiple Listing Service and is deemed reliable but is not guaranteed). For an updated Spring Branch real estate pricing or trend analysis, please contact Paige Martin atPaige@HoustonProperties.com. There’s a great variety of styles of homes for sale in Spring Branch Houston. Custom-built homes on generous lots are a popular option for new constructions. There are also many renovated 1950’s ranch style homes, classic suburban, luxury estates, large lots, condos, and townhomes in this much sought-after neighborhood. Like Memorial Houston, Spring Branch single-family homes for sale generally offers much larger lots than most Inner loop neighborhoods, but at a lower price range. 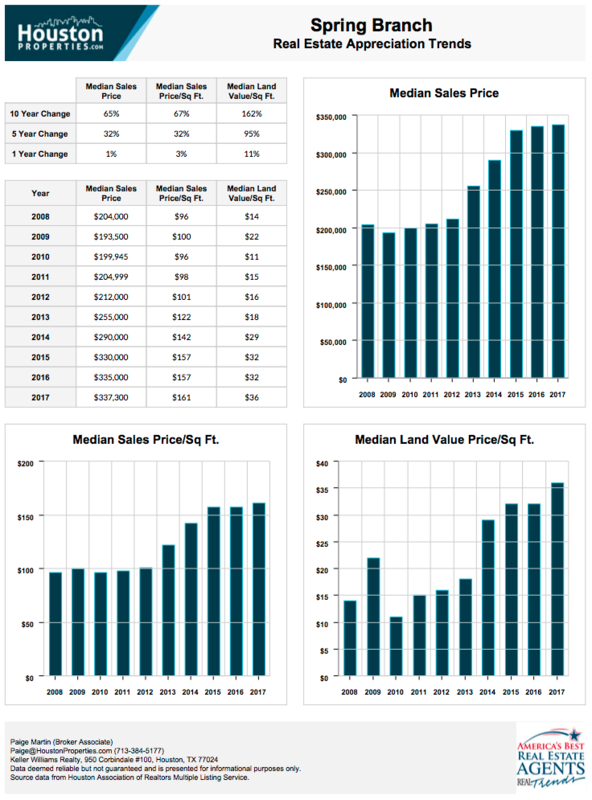 The median price per square foot is $124. With an average of 900 Spring Branch Houston single-family homes sold per year, the community is well on its way to establishing itself as a community for settlers. Its proximity to major job centers such as the booming Energy corridor, and the ongoing redevelopment, property values will most likely increase in value in the coming years. The rising prices of single-family homes have also boosted the market for Spring Branch Houston townhomes as well. The low inventory of Houston properties creates a demand for townhome development, and many developers have started to fill this demand in Spring Branch. Spring Branch townhomes for sale provide home buyers the option of buying new property in this desirable neighborhood, with the added benefit of little to no yard maintenance. This is also one of the reasons it has become a favorite for empty nesters. Home owners can easily live elsewhere during part of the year. Despite the continuous development of Houston condominiums, there’s still not a lot of Spring Branch Houston condos for sale. This will likely change with many of the wooded lands within the neighborhood being developed into mixed use properties. Spring Branch is one of the oldest neighborhoods in Houston. The Spring Branch area in Houston began as a religious community of German farmers in the 1830’s. The earliest settler, Karl Kolbe, settled on the banks of Spring Branch where it joined Buffalo Bayou. The heavily wooded area had an abundance of lumber that was used to build early local churches and shops. Many of the surrounding forest land were cleared in 1848 to make way for farms, and farming became the primary industry in Spring Branch Houston. As the area moved towards industrialization, the farmlands were sold and developed. They were replaced with subdivisions, schools, and shopping centers. Like most areas in Harris County, Spring Branch transitioned from being rural to urban. Spring Branch has undergone many changes throughout the years, but many of the street names pay tribute to the first settlers. Houston has a vibrant ethnic tapestry that merges its diversity with its love for food and culture. This is specially true for Spring Branch Houston restaurants where you can find various cuisines cloistered together, allowing residents to enjoy the world’s best within a few minutes from home. Spring Branch Houston collectively has a WalkScore of 50/100. Most of the area remains to be car-dependent, although some areas have better walkability. Spring Branch east has better access to most commercial areas due to its proximity to the 610 loop. Compared to Memorial however, Spring Branch has more business establishments, especially along its main roads. While Spring Branch isn’t known for the arts, there’s surprisingly a vibrant art scene in the neighborhood. The Houston City Ballet, Uptown Dance Center, Andalucia Media Arts Center, and VF Fine Arts are all within the neighborhood. Residents can also enjoy the vast literary collection of Spring Branch Memorial Library just on the other side of Katy Freeway, the Arnold L. Hillendahl Library on Gessner, and the Elizabeth L. Ring Library on Long Point. Other nearby shopping centers include Northwest Mall, Northway Shopping Center, Nottingham Shopping Center, Lantern Lane Shopping Center, and The Galleria.